Microsoft wants to make the Raspberry Pi 3 computer easier to use for people who want to be device makers but haven't worked with hardware before. Microsoft is developing the Seeed Windows 10 IoT Core Grove Kit with China-based Seeed Studio. The kit has all the hardware and software needed to start creating cool new devices. Contents of the kit include the Raspberry Pi 3, a breakout board, connectors, cables and a smartphone-like screen. The kit will be available in the summer, though the companies didn't immediately provide a price. "If you're interested in getting started with software, you know your hardware ... but you're scared of plugging in your hardware and electrocuting yourself, this kit is for you," said Daniel Rosenstein, lead principal program manager at Microsoft. Microsoft introduced the kit during a presentation at last week's Build conference, during which Rosenstein sharing ways on makers could make money with their US$35 investment in Raspberry Pi 3. Microsoft is encouraging developers to make new gadgets, robots and IoT equipment as it tries to put Windows 10 onto more devices. The Raspberry Pi 3 supports Windows 10 IoT Core, a slimmed down version of Windows. People could make a number of innovative devices with Raspberry Pi and Windows 10 IoT Core. Microsoft has listed some interesting projects on its website for makers, including a face-recognition door, a hexapod, and a reconnaissance droid robot. The kit's goal is simplicity. All the connector cables are included, so makers don't have to go looking for them online. Parts don't need to be soldered together with this kit, removing one of the more intimidating steps of working with developer boards. The breakout board, which provides connectivity to more parts like LED bars, servos, and sensors for temperature, light, sound and distance, can be easily placed around the Raspberry Pi. The Raspberry Pi 3, which is the size of a credit card, has the ability to work with a limited number of sensors and components. The breakout board provides connectivity to more components through buses like GPIO, I2C, SPI and analog input and output. 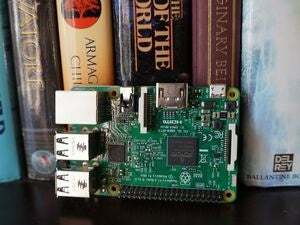 Raspberry Pi 3 became available at the end of February, with standout features including a 64-bit ARM processor and Wi-Fi connectivity. Seeed Studios is based in Shenzhen, China, and offers a wide range of developer boards and components.